I am fundraising to art Attack! One day as I walked out of a restaurant after having finished my breakfast, I happened to see this quaint little man, sitting under the shade of a flower-tree, engrossed in what he did best: making a portrait. I'm not much of a talker, so I just stood there and watched him quietly as his deft hands carefully worked on a portrait of a couple, recreating every feature accurately. As I sat down, he looked at me, flashed a smile, and got back to his work. His nails were filled with dirt and his hair was unkempt, but his finnesse was impeccable. He strained to look at the tiny photo provided to him through his thick glasses, in an attempt to capture every detail with the few colour pencils he had. The only things he carried around, were a water bottle, a plastic bag and crutches. That's when my focus shifted to his legs, one of which was oddly twisted and painful looking. They say you have very few such moments in life when you are cought unaware and overwhelmed at the simplicity and marvel of people around you. This was one such moment for me. 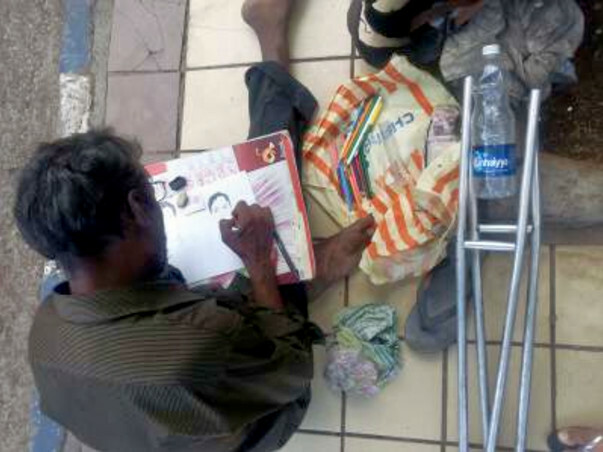 Here was this man- ridden with poverty, with an ailing leg and failing eyesight. And what did he choose? He chose to smile about it and is trying to make a living out of the amazing talent and limited resources made available to him. 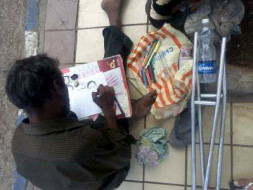 I want to encourage this man by giving him access to adequate art material so that he could showcase his talent more efficiently. However, art supplies are pretty expensive and may add up to quite a bit. I hope you all will pitch in and bring about a positive change in the man's life.